Well, I’m back from my little trip to Burbank, and I gotta tell ya, I had a friggin’ blast! We arrived at the hotel around 11:00 a.m. on Wednesday, and our room was ready – technically early – which is good because I was thisclose to pulling the good ol’ “don’t you know who I am” line on them (I’m sure it would have gotten us nowhere, but it’s still fun to say). We took a cab to Gate 3 of the Warner Brothers Studios – which is actually a parking garage – and did our little check in thing. By 3:30 we were seated in the studio and starting to film. My friend Lisa sat on the aisle, and I was one seat in. Nice!! 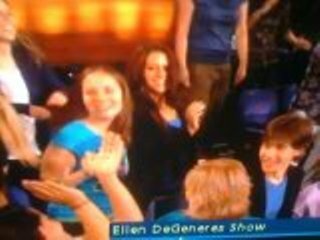 Especially since when it came time for Ellen to do her dancing in the audience thing, she came right next to us. According to the reports of friends and family (I have yet to actually watch the show – shame on me! ), Lisa and I were on screen in the first six minutes of the show. Rumor has it we made it on camera one other time, but like I said, I haven’t watched the full show yet so I’m not sure. When the show aired on Thursday, my friend texted me this picture, but I’m not sure if it’s from our first appearance on camera, or the second one – not that it matters, because hey, we made it on TV and you didn’t. Ha! The guests for the day were actor David Duchovny who was promoting his new project The Joneses, which also stars Demi Moore, and to tell Ellen that he needed more underwear – which she happily gave him. Actor/Comedian Aziz Ansaria was there talking about how great it is to be on NBC’s Parks and Recreation, and that he’ll be touring his comedy this summer. Dude is funny! Erin Andrews and Maksim Chmerkovskiy of Dancing with the Stars were there and graced us all with their dancing. Awesome!! That’s the closest I’ve come to a real ballroom dancing performance; something I’ve always wanted to experience. The musical performance for the day was Nikki & Rich, who sang their catchy tune “Next Best Thing.” It was their first national television debut, and we all went home with free CDs. Woot! Long story short, I had a really great time, and it’s all thanks to Lisa. Thanks Lisa!! P.S. Ellen is really pretty. Like, really genuinely pretty. 50 queries in 0.652 seconds.